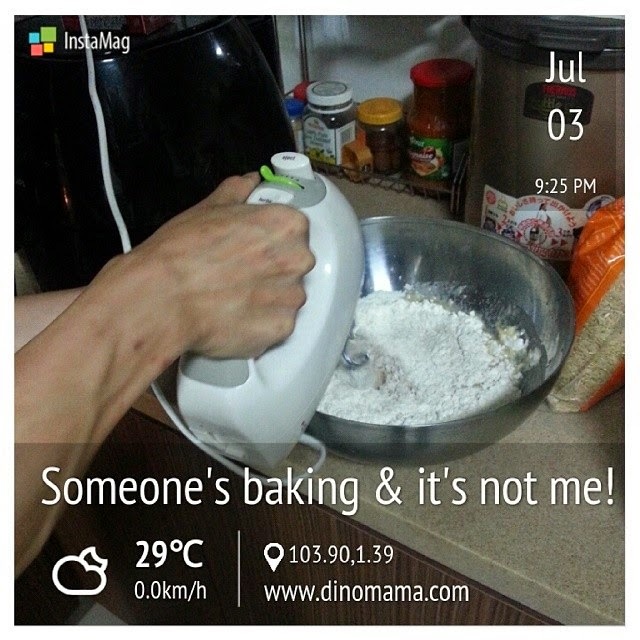 Some of you saw this photo which I uploaded in my facebook yesterday night, well what do you know, DinoPapa decided to bake! Nothing fanciful, just a simple wholemeal bread. Recently we have been buying wholemeal bread to eat as breakfast but finds that the price of a loaf @ $2.50 is a little bit pricy. We probably have to buy 2 loafs a week if 3 of us have the bread as breakfast every morning. 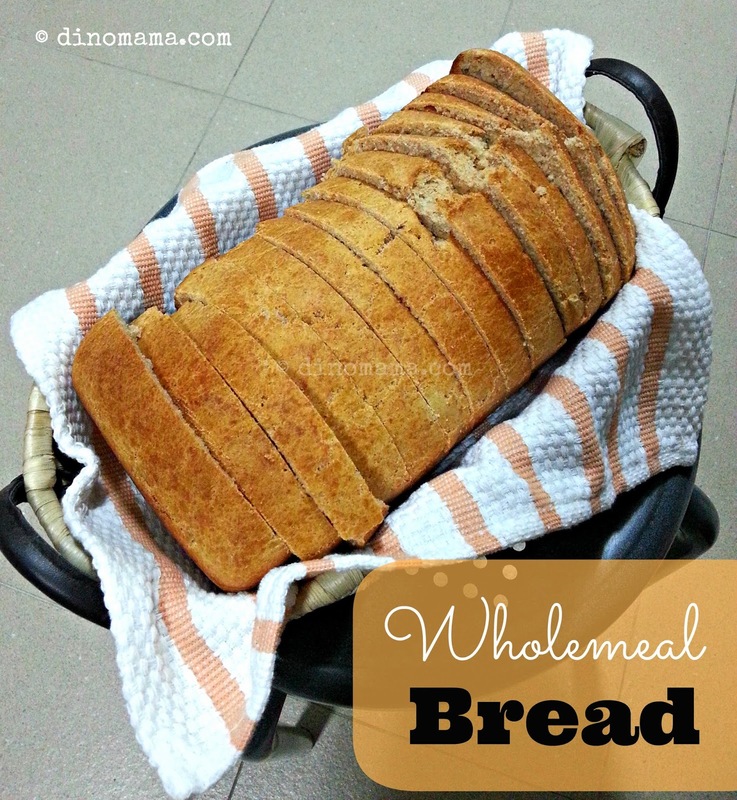 I casually commented to DinoPapa that we can easily make a loaf of bread under 40mins. A few days later I bought the wholemeal flour intending to try to bake a loaf of wholemeal bread by using Domestic Goddess Wannabe's 40min Bread rolls recipe. I even sought valuable advice from my very experienced baker and cook friend Granny Smith, asking all sorts of noob questions as I want to make sure that I don't fail in baking this. I was so pumped up with confident that I will definitely succeed in my bread making mission BUT I never got around to do it as I was busy. 2 nights ago DinoPapa announced that he will bake the bread the next day, so I gave him the recipe, told him where to find the ingredients, the mixer, the dough hook etc in the kitchen. Gave him Domestic Goddess Wannabe's website link in case he wants to see photo and went off to bed. However I left out the most important thing - baking time. I forgot to tell him to bake more than 12mins because it's a loaf and not rolls, plus I forgot to teach him to use the cake tester to test the bread thus 1st loaf was uncooked in the middle. Nevertheless it took him 2 tries and viola~ freshly baked wholemeal bread~ So glad that he did not give up after the 1st failure and tried it again later that night. I came home to see DinoPapa preparing to bake his 2nd loaf of bread, 20mins later the dough is in the oven baking. I simply love the smell of fresh bread in the air. 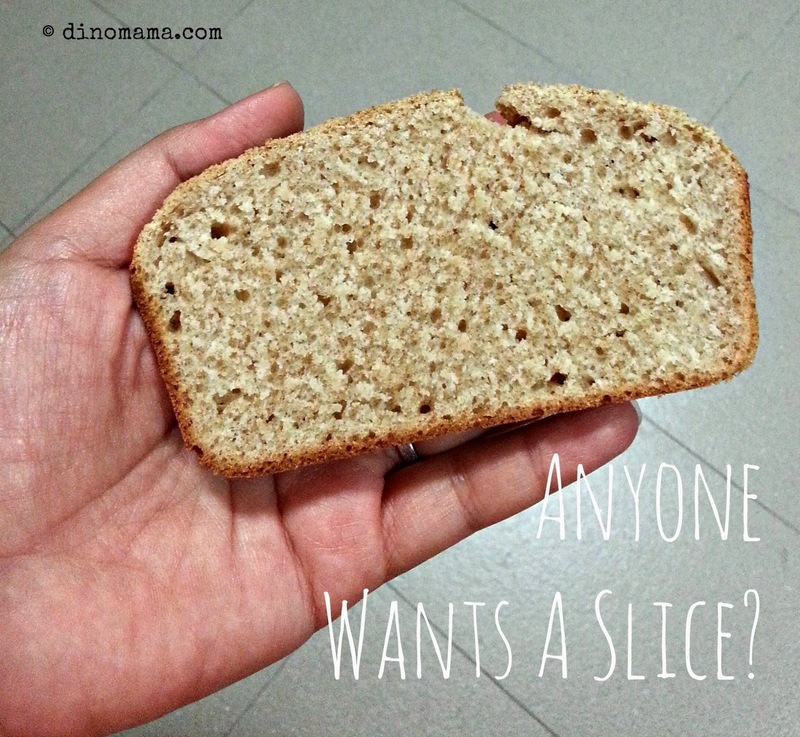 Now here is the most beautiful slice of bread I've ever seen and it taste heavenly too! So what did I changed from the original 30/40mins bread roll? Besides substituting 1½ cup wholemeal flour to the original 3½ cup bread flour, we also increase the baking time to 20mins for a 9 x 5 loaf tin. Our bread looks a little bit flatten, I guess the dough was not enough for our 9 x 5 loaf pan but we are ok with it, smaller pieces will means that it's easier for DinoBoy to handle without dropping crumbs all over the floor. We absolutely love this recipe and will definitely be baking it more often instead of buying bread from the store. I am already thinking of adding almond flakes or raisins to the bread. 1. Heat oven to 220C. 2. In your mixer bowl combine the water, oil, yeast and sugar and allow it to rest for 15 minutes. Using your dough hook, mix in the salt, egg and flour. 3. Knead with hook until will incorporated and dough is soft and smooth. (Just a few minutes) The dough will be a little sticky. I oiled my hands, knead it one to two times, and it became really easy to shape. a) If your dough is too wet, add a little more flour and knead a few times. b) IF YOU DO NOT HAVE A MIXER, just hand knead the dough for about 5 minutes. 4. 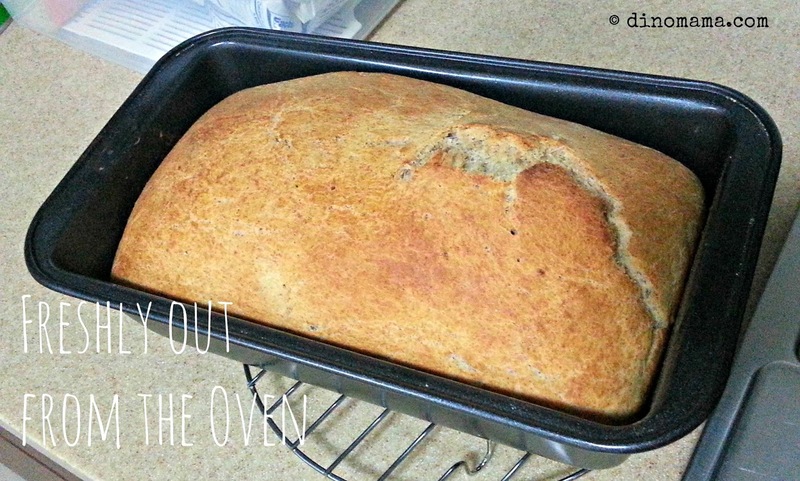 Roll the dough and place in a greased 9 x 5 loaf pan. 5. Cover the dough and allow to rest for 10 minutes. Glaze with egg wash if you want. 6. Bake for 20 minutes or until golden brown. Stick a cake tester into the middle of the bread to see if its cooked. 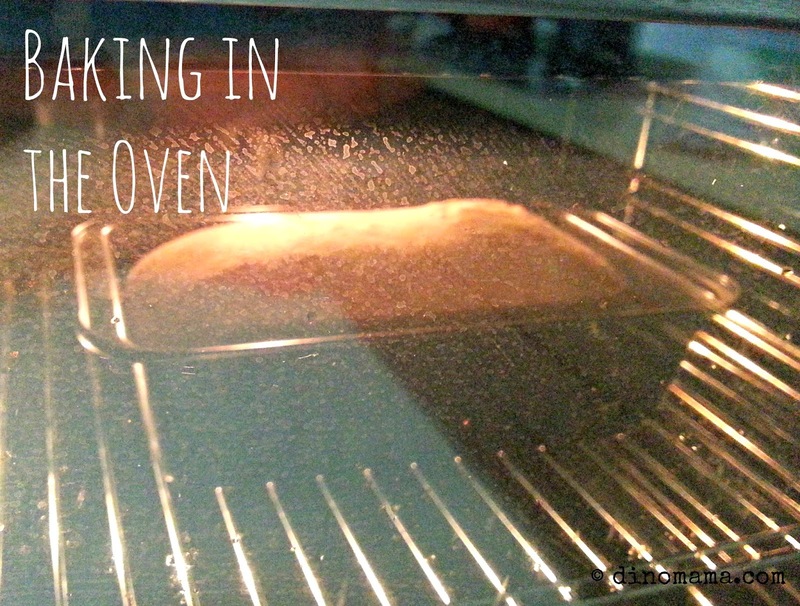 The crack in the loaf happens because of the expansion of the gases when the loaf first went into the oven. You can overcome this in a couple of ways, but the easiest is simply to take a very sharp little knife and make a cut about 1/2 inch deep down the middle of the loaf just before you put it into the oven.